On 4/11/2013, New York Times, Editorial Board wrote an article title “Mr. Kerry Fumbles In Egypt”. 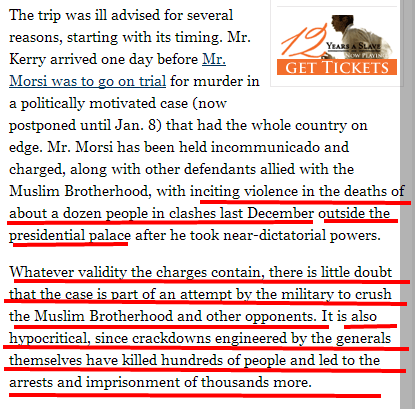 What they wrote about Kerry’s visit to Egypt, is not the issue here, But the issue is what they wrote about Ousted President Morsi and other 15 Muslim Brotherhood charged with inciting, Premeditated and deliberate killing and torture of demonstrators in front of Etihadeya presidential palace, which took place on 5/12/2012. Charges relate to the death of about a dozen (11) demonstrators and more than 800 got brutally tortured and seriously injured and also resulted with permanent disability for many, in violent clashes outside the presidential palace after ousted President enraged protesters with a decree expanding his powers. The following two screenshots showing what New York Times have published: (Click on the following screenshots to enlarge it! According the above screenshots, New York Times have little doubts of the case, and described it, as a Military attempt to crush Muslim Brotherhood and other opponents! What does this statement mean? that it is a fake charge planned by the Military against Brotherhood? and who crushed who in this specific crime, the ones who got tortured and killed, or the ones who committed the crime with cold blood? And what does the Military have to do with this Crime? If the New York Times consider the Military faked these charges in this specific case trial against Brotherhood, then consequently, New York Times is also doubting and accusing indirectly, the Judges and the General District Attorney and the Prosecutors, who worked on this case, that they are corrupted too! We are then talking about a big conspiracy here against Brotherhood and Ousted Morsi, and not a fair trial which was built on evidences, according to New York Times! Doubts about what? about a crime resulted the death of 11 victims got killed, and more than 800 other victims got tortured and brutally beaten by “Freedom and Justice”, Muslim Brotherhood Political party leaders and members, and Muslim Brotherhood members of the Presidential Cabinet, inside and outside the presidential Palace, ended with disability of many of the victims! I guess, New York Times, only consider Brotherhood leaders and supporters are the only Human Beings in Egypt, and the rest of Egyptians who are Non-Brotherhood, if they get killed or tortured by Brotherhood, they are just Trivial Insects! I guess, consequently too, the 800 victims of Torturing and serious injuries caused by MB against them, it is then the Victims who tortured themselves and they are corrupted also, because they are involved in that conspiracy as well, Framing that crime against Muslim Brotherhood, according to the analysis of New York Times! Moreover, New York Times, wrote that it is Hypocritical, since crackdowns engineered by the Generals themselves, have killed hundreds of people and led to the arrests and imprisonment of thousands more! So, this statement of New York Times is spreading to the whole world, that Brotherhood Regime is innocent from all the crimes,which they have committed against 87 Million Egyptians, and all the institutions of the Egyptian State beside, more than 33 Million Egyptians had a meeting behind a closed secret door, and planned a serious conspiracy against Brotherhood Regime to get them down, just like that!!! 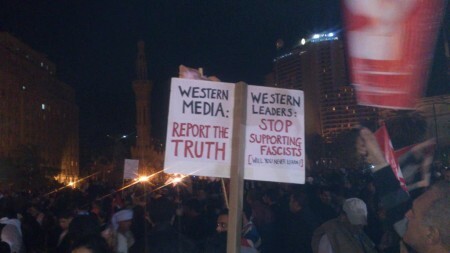 If the Muslim Brotherhood are innocents from all the crimes committed against Egyptians opponents, then maybe the New York Times Editorial Board, can explain to us, how come, we haven’t seen Million of Egyptians revolting in the whole country against the Egyptian Military Oppression and fake charges against MB? Are Egyptians afraid to revolt? As far as I know and eye witnessed with my own eyes and ears as an Egyptian Citizen, since the 25th of January 2011, Egyptians are no longer scared or oppressed by any authority in the country. They revolt whenever they feel it is necessary to revolt, because they have decided to be the Source of Authority in the Egyptian State. It is as simple as that! New York Times described General Abd El-Fatah El-Sisi,the Ringleader of the Coup! Ringleader in the English language, is defined in English: “a person who leads others in any kind of unlawful or mischievous activity”! So, New York Times is describing the Egyptian Minister of Defense, as the Chief of a gang here, and consequently, if he is the leader of a gang, then the Egyptian Military Leaders and individuals are a gang too! In addition, New York Times, consider more than 33 Million Egyptians revolt against the Brotherhood Regime, is a Coup! is this a challenge to the Egyptian will, or is it a despise and undermining and direct insult to more than 33 Million Egyptians will!? I believe that it is all the above! If the New York Times would like to keep what’s left of their Face-Saving, then I believe their fans and readers deserve some respect from the New York Times here, in respecting their mentalities. New York Times, since they took upon themselves the issue of playing the Muslim Brotherhood’s defenders and Lawyers, New York Times, is immediately required to provide accurate and Obvious Evidences in relation to all their direct serious accusations addressed to the Egyptian Government and the Military, or to apologize to the entire Egyptian People for publishing fake news about Egypt and SHUT-UP! This is not the first time, New York Times, publish this kind of deliberate misleading news about Egypt! And obviously it is not going to be the last time either! Unless, the Egyptian Government do something about it! Egypt is ruled by the law, and one of the law’s missions is to protect people’s reputation, when it gets deliberately smeared by whoever think can shoot accusations, and imagine that they can really get away with it! The following link, is a documented evidence, all videos recorded on the 5th of December 2012, published by an Egyptian Blogger, who gathered all the videos, which show Muslim Brotherhood leaders and supporters, and including also Muslim Brotherhood individuals, who worked in the presidential Palace, appointed by Ousted President in the Presidential Cabinet, from the minute they announced publicly, that they will end Anti-Brotherhood protests by force and they will intensively mobilize their supporters to make sure those protests against Brotherhood regime, will be ended immediately. All videos, showing Brotherhood leaders and presidential Cabinet members, who supervised the torturing of demonstrators inside and outside the Presidential Palace of Etihadya in Heliopolis Area, while Mohamed Morsi ousted President was sleeping, enjoying his Militias torturing to his opponents inside and outside the presidential Palace. When you click on the following link, you will find many uploaded videos links on YouTube, just click on each video link, to watch them. Click here, Link of Documented Videos of Etihadeya Palace Massacre, committed by Muslim Brotherhood and sponsored by ousted President Mohamed Morsi against more than 800 Egyptians got killed and brutally tortured.